Frank Stephenson & Son Funeral Directors provide the highest standards of funeral care, services and facilities to the local community. 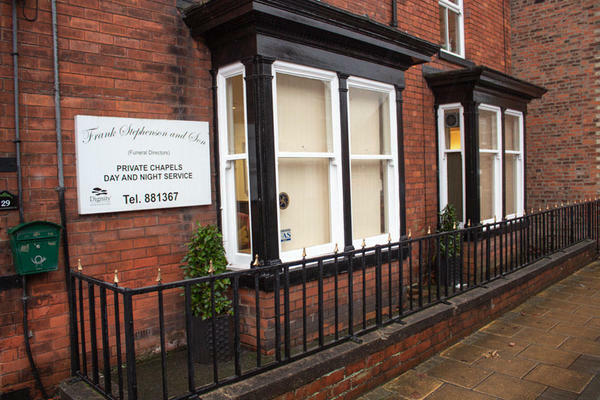 Based in Beverley, we have conducted funeral services for many years, building up a wealth of knowledge and expertise. We will use our experience to help arrange the perfect farewell for your loved one. Our funeral home is tastefully decorated, and designed to be warm and welcoming so that you can feel at ease when you visit us. We also have two private chapels of rest, where you can spend time alone with your loved one prior to the funeral service. Whatever kind of funeral you have in mind for your loved one, we will be able to help make it happen. We are here for you 24 hours a day, and we are never more than a phone call away. When you need us most you can depend on our professional funeral directors to give you our full support. Call us today on 01482 881367 to talk through your personal requirements. At Frank Stephenson & Son Funeral Directors, we understand how special life is with those that you love. For us, every funeral is unique and personal. We have a service to fulfil every wish, with every detail carried out with the same uncompromising quality of care. From a traditional service, to a colourful woodland burial, your options are limitless with our Full Service Funeral. If you have a little more flexibility when it comes to arrangements, then we can provide a Simple Funeral for a lower cost. We have a small parking area as you pull in from Minster Moorgate. We are near Beverley Minster on Minster Moorgate. Our staff are available 24 hours a day on 01482 881367 if you require our services outside of these hours. What an amazing service we received from Lewis and his team. Nothing was to much trouble at this difficult time. From the first discussions to the end of the service, both Kevin & Paul were fantastic. Everything was looked after so professionally which meant that we didn't have anything to worry about. Many thanks. From the moment we met Paul from Stephenson & sons we were looked after and were treated with sensitivity and respect. Our wishes were carried out and all arrangements were handled professionally. All the staff in the Beverley branch were kind and helpful. Would be happy to recommend the team. From the moment Lewis enterered our house for the removal of my dear Wife to the Chapel of rest to the celebration of her life and the eventual cremation and the presentation of her ashes Lewis and his staff treated myself and family to the utmost respect and dignity. His organisational skills are second to none, his caring treatment of my wife most certainly eased my worries. Lewis is a superb friendly young man whose whole attitude obviously permeates amongst his staff. Thank you Lewis for your caring about me and my family, you made the whole traumatic experience of losing a loved one more bearable. Thank you Lewis and your staff. Thank you for the kind comments posted on your online review. I am pleased that the arrangements for your Wife were carried out to your satisfaction and that our team provided the highest level of care and guidance for you and your family to help make things easier for you at such a difficult time. Excellent service from start to finish, Perfect. Thank you for posting your review online. I am glad that we were able to provide you with the care and support needed and we were able to help make things easier for you at such a difficult time. We would like to thank all at Frank Stephenson & Son for their kind,efficient & sympathetic service during our recent loss. I cannot praise the management enough-from day one I had so much support -calling me daily and at the end of the phone as and when I needed anything. Right from my first tentative telephone call knowing my father of 92 was terminally ill they were professional, compassionate, passionate, and anticipated where we as a family group would be in psychological terms during this upheaval in family life. Their advice and encouragement during this traumatic period was invaluable. Our ability to express our wishes in a bespoke service for a wider family and friends send-off gave us a much better closure than I ever thought possible. We knew with this team our father's farewell couldn't have been bettered. Two additional aspects worth noting are at no time were we pressured into "adding value" to our farewell. Given media stories of such behaviour it was a welcome not to suffer the ignominity of battling raw commercialism as well as grief. The final aspect was the promises that were made - and kept: "That we will have continuity with the named person leading the funeral team" and the Celebrant being there for support throughout the jitters that lead up to the actual ceremony. Our family recommends and thanks Paul and his team for their remarkable service. Thank you to everyone involved for your excellent service and consideration.